Factory will use black belts if art is predominantly black unless otherwise noted. Cut-to-size: Each C4 belt is cut-to-size fit, giving you the freedom to perfectly tailor it to your waist. The classic belts come in one 50" length, which you can trim from there. Interchangeable buckles are made of a high-impact polycarbonate. Fits all sizes (up to 42"), XL sizes available upon request (fits up to 52"). Full-color Digital UV process, one sided imprint. 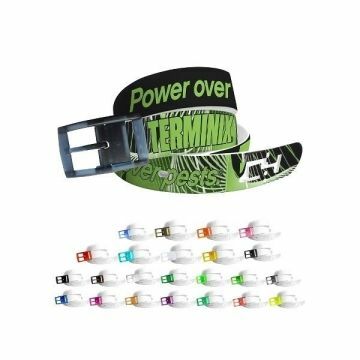 Belt strap is made of a super durable Thermoplastic Elastomer (TPE) plastic; the same material used in snowmobile tracks.